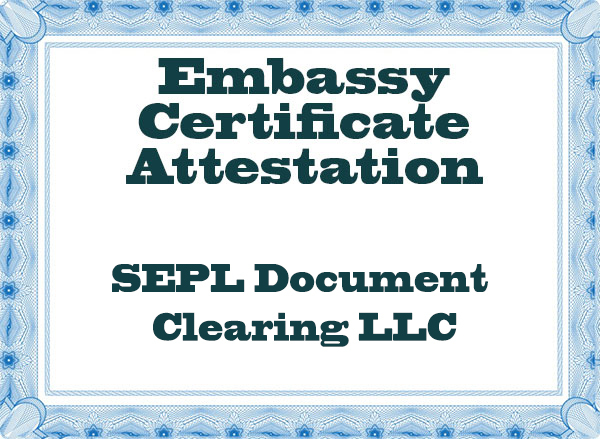 SEPL Document Clearing LLC provides excellent quality of Educational & Non Educational documents Embassy Certificate Attestation services for all the foreign embassies located in United Arab Emirates. We are eminent in providing Attestation services from Embassies in UAE like India, Canada, USA, UK, Australia, etc. It’s been a decade that people in UAE are using our complete range of Attestation services in Dubai from UK, USA, India, Australia, Canada, Oman, Qatar, Bahrain, Kuwait and Middle East. Our main services is UAE Embassy legalization from different UAE Embassies located around the world and various other services related to UAE Embassy Attestation like Authentication, Verification, Consulate attestation, Ministry of Foreign Affairs (MOFA) Attestation in UAE, etc at cheap and affordable rates. Attestation is a process that proves the document genuine. So process has to be undertaken according to the rules and regulations respective country government. We in UAE undertake all country Embassy certificate Attestation for UAE without your presence and make your journey trouble-free and affordable. The Government of United Arab Emirates requires all Educational Certificates and Non-Educational Certificates issued from India to be authenticated by the Indian Embassy/Consulate in UAE for further Attestation by the Ministry of Foreign Affairs, Government of UAE before granting UAE Visa. The Consulate General of India in Dubai provides attestation services to Indians and Foreigners. The Indian Embassy/Consulate in UAE also performs Notary functions like Attestation of certificates/documents executed by Indian citizens in India and UAE. The UAE Government also accepts certificates attested by its Embassy in New Delhi and Consulate in Mumbai provided the certificates were also attested first by the Consular Section of the Ministry of External Affairs, Government of India. The document to be attested must be presented in original with a photocopy and signed before the Consular Officer, who will verify and satisfy himself about the identity of the applicant from his passport. The original passport and a photocopy should also be presented. Superb Enterprises Pvt. Ltd., a division of SEPL Businessmen Services LLC is a pioneer in all attestation procedures from various departments like GAD, State Education Department, Notary, and Home ministry, SDM, HRD and various International embassies located in India. such as Indian Birth Certificate Attestation, Indian Death Certificate Attestation, Indian Divorce Certificate Attestation, Experience/ Employment Certificate, Indian Marriage Certificate Attestation, Indian Medical Certificate Attestation, etc. such as Indian B.E Certificate Attestation, Indian M.E Certificate Attestation, Indian M. Ed Certificate Attestation, Indian B Tech. Certificate Attestation, Indian M. Tech Certificate Attestation, Indian Degree Certificate Attestation, etc.